In the 1960s, major medical textbooks in ophthalmology proclaimed that newborns are blind at birth. The understanding of infants’ cognitive development has been transformed in recent decades by researchers like Aslin, who have established that babies just months old have mental capacities formerly believed to be the domain of children much older. How can you know what a baby is thinking—and how she’s thinking it? Technology is a big help. Computer software allows researchers to follow automatically where a baby is looking. The Rochester Baby Lab uses a device called Tobii, an eye tracker that reflects a dim infrared light onto the eye and senses its reflection pattern to calculate the exact point of the baby’s gaze. Another system, the Yarbus, is a head-mounted eye tracker that allows researchers to follow a baby’s gaze in natural settings. While eye tracking is an indispensable tool, it’s not the only one. Aslin and his students also rely on more direct ways of studying the brain. “When you study behavior, of course you’re studying how the brain controls behavior, but it’s rather indirect. You’re not actually looking inside the brain. You’re using the behavior as a shortcut to study what the brain is doing,” says Aslin. Traditional methods used by neuroscientists aren’t particularly apt for the study of the infant brain. EEGs provide indistinct information; it’s not clear where in the brain the electrodes are getting their signals. MRIs and functional MRIs—which show the brain in action—require the subject to remain perfectly still, no baby’s or young child’s strong suit. Aslin’s lab uses a third technique, called optical imaging. Noninvasive and relying only on light, the method uses metabolic feedback to indicate what parts of the brain are involved in a given visual or auditory task. The lab uses a commercially produced cap now, but Aslin is working with Andrew Berger, an associate professor of optics, to create a cap specifically suited for use on babies. With a grant from the National Science Foundation, Berger is building on advances in infant cap design already made by a group at Washington University in St. Louis. The cap is sensitive to what’s happening with blood both in the brain and on the scalp, Berger says; what he’s trying to do is to separate those results, so that scientists can “tune in” to what is happening only in the brain itself. He and Aslin will begin testing the improved device in the Baby Lab this fall. Success would be a boon not just for researchers but for physicians, too. Optical imaging can detect injuries to the brain from the birth process; a more sensitive device would help to catch neurodevelopmental delays in children born prematurely before they demonstrate learning problems. Currently, those delays are hard to detect in infants, Berger says, “and the later you catch them, the more catch-up” the child has to do. While most of the River Campus is populated by typical college students juggling laptops and coffee mugs, there’s a corner where sippy cups hold sway, where tiny toddlers—and kids too young even to toddle—make themselves at home. It’s the Rochester Baby Lab, on the fourth floor of Meliora Hall, a research facility Aslin established soon after he arrived at the University in 1984. It’s a fun and cheery place, with brightly painted walls and lots of toys. But it’s also home to serious psychological research, as Aslin and his students investigate how language and perception develop in babies and young children. There are 10 studies currently under way on language comprehension, visual and auditory attention, expectation formation, music cognition, and more. Many times every week, babies come to the lab, nestle into a parent’s lap as they watch a computer screen or wear a comfortable and harmless cap that monitors their eyes or brain, and do their part for science. In probing infant cognition, Aslin—president of the International Society for Infant Studies—and his students are uncovering details about origins of knowledge and, ultimately, what it means to be human. In practical terms, it comes down to a version of a question more culturally associated with political scandal than with the nursery: What do babies know, and when do they know it? “I think the fundamental question in the field is this: why are we as human beings different from all other species?” he says. Another dimension of young children’s cognitive development is social, and Lucia French, the Earl B. Taylor Professor at the Warner School and a developmental psychologist, investigates social interaction and its effect on language acquisition. “Babies have amazing capacities, but many children don’t have an opportunity to fulfill their potential because they’re in environments that don’t offer adequate opportunities or stimulation,” says French, whose research examines the relationship between language and cognitive development during the preschool years. If children are “in a home environment where they’re not supported in using language to its full potential as a means of social engagement, information exchange, and articulation of thoughts,” their ability to use and understand language outside of the context of simple commands—to ask questions, discuss feelings, and think about the past and future—is compromised, French says. French has developed a science-based preschool curriculum to foster language development, learning, cognition, and school readiness. Formerly known as ScienceStart! and now called LiteraSci (www.literasci.com), the program has received $5.5 million in federal funding, and students who have been through the program have shown significant gains in language skills, particularly in vocabulary acquisition and the ability to give explanations. They’ve also noticeably advanced their knowledge through a scientific approach of raising questions and investigating possible answers. “As a developmental psychologist, I never think it’s too late for adequate development,” but if children hear language only in the form of commands directing their behavior and aren’t exposed to conversation and questioning, “they’ll only fall further behind” in their language and cognitive development. Study of infant cognitive development grew out of experimental psychology, but the field has also been influenced by researchers in education and pediatrics. The Rockefeller Foundation supported two “child welfare stations” in the 1920s, one at the University of Iowa and one at the University of Minnesota, to hire faculty interested in child-rearing practices. “Between the time these welfare stations were commissioned and, roughly, 1960, the field of child psychology—and within that, the subfield of studying infants—was pretty tiny,” says Aslin. But research took off in the 1960s, spurred partly by increased research funding generally, and also partly by growing interest. The study of learning, in both adults and animals, was well established. “So it was a natural next step to study learning and cognition in infants and children,” Aslin says. Perhaps no factor was greater, however, than advances in technology. As scientists and engineers developed devices such as small video cameras and electrode arrays in service of space exploration, they were inadvertently creating tools that would give researchers a way to find out what was going on in another largely unexplored frontier: the minds of infants. It was mysterious terrain, seemingly inaccessible because of babies’ inability to communicate verbally. But there are a few things babies can do from the time they’re newborns, and one of them is look. And that can disclose a lot. Interpreting the meaning of babies’ gaze patterns—where they choose to look and how long they opt to look there—isn’t a simple pursuit. There are many factors that may influence such measures. Is the baby looking at a scene because something in it is unexpected and therefore interesting, for example, or is she attentive because it’s reassuringly familiar? Researchers have to be scrupulous in recognizing those complexities and not misreading preferences. But even with those limitations, attentiveness to where babies look has proven a powerful tool. He cites a classic example of how the timeline of infant development has shifted. Take, for example, what’s called “object permanence”—children’s realization that an object or person no longer visible continues to exist, a developmental concept introduced by Swiss psychologist and philosopher Jean Piaget. To find out when babies begin to comprehend object permanence, Piaget and many researchers after him tested children by showing them an object and then covering it. The young subjects literally grasped the issue, they suggested, when they responded by pulling the cover off to reveal the object below. “They get that it’s still there,” Aslin explains, an understanding that seems—by this measure—to arrive around 9 or 10 months of age. But demonstrating that understanding relies on the ability to grab purposefully and remove the cover—“a behavioral task,” says Aslin. Is it possible that babies younger than that understand, too? Eye-tracking research has suggested that’s the case. Researchers have shown that babies as young as two months register surprise—as measured by looking time—when an object that goes behind a wall is treated in a video as if it weren’t there anymore. “They looked longer at the unexpected event, and they’re doing it much younger than the babies who could reach,” Aslin says. Through optical imaging and eye tracking, Aslin and his team of graduate and postgraduate researchers pursue two main strands of investigation at the Baby Lab: inquiries into language acquisition and studies of visual attention and visual learning. “We start as these little creatures who know so little about our world. How do we get from there to adulthood?” says Sarah Davis, a doctoral student in brain and cognitive sciences who conducts her research on how small children process probabilistic information. In collaboration with Aslin and MIT graduate student Steven Piantadosi, she conducted a recent experiment on what they call the “Goldilocks effect.” Using eye-tracking data collected from infants at the lab, Kidd and her colleagues showed that the babies’ attentiveness to visual scenes was influenced by the level of surprise—due to new information—involved in the scenes. Like the nursery tale heroine, babies prefer something that feels “just right”—they give the greatest attention to scenes that are neither too predictable nor too surprising. The experiments run at the lab are mostly computer based, and are controlled by the infants themselves. When their attention flags, the scene changes—footage of a laughing baby, an infant favorite, recaptures their attentiveness—and where they look influences what they see. “It’s interactive, and we know they love interactions,” says Mohinish Shukla, a postdoctoral researcher in the lab who has moved this fall to a faculty position at U-Mass Boston. His interest is language acquisition, and a recent study he conducted on infants, showing them multiple objects and giving them the name of the object in a sentence, demonstrated that they could pick out the object and learn its name by six months of age rather than the expected 17 months. While other such studies conducted elsewhere have given babies the words in isolation rather than in the context of sentences, Shukla thinks the complexity of conditions in his experiment may account for the babies’ performance—the more complicated task of picking the word out of the sentence may actually have been easier for them because that’s the way they hear language every day. Fifteen years ago, Aslin and colleagues Elissa Newport, the George Eastman Professor of Brain and Cognitive Sciences and Linguistics, and Jenny Saffran ’97 (PhD)—now a professor of psychology at the University of Wisconsin—brought babies to the lab, where the children encountered a simple nonsense language the researchers had created to ensure they wouldn’t bring any prior knowledge to bear on the experiment. “We wanted to find out what they could learn in the lab, not what they’d already learned in the environment,” Aslin says. The children listened to the language, “and then we tested them to see whether or not they’d learned the underlying structure of this little language.” They had. As research continues to suggest that cognitive abilities develop earlier than formerly thought, scientists are left with the question of just what that means. “One strong hypothesis is that when you’re measuring looking times, that’s the same thing as what you end up with as a mature person. It’ll become more elaborate with time, and you can verbalize it,” Aslin says. It could be that learning object permanence and other capacities are, like language, learned through exposure, he says, and that babies’ capacity to draw lessons from that exposure kicks in far earlier than we have traditionally thought. While advances such as eye-tracking devices and optical imaging have made easier the pursuit of such questions, the task of working with babies remains a challenging one. Windows of opportunity are small, and while specially designed videos can capture a six-month-old’s attention, his wiggly toes and other distractions can prove diverting as well. “Adults don’t ‘fuss out,’ ” says Davis, using the researchers’ shorthand term for when a baby’s mood change cuts short an experiment. “You don’t have college students who are crying because they haven’t had lunch yet.” But there are advantages, too. 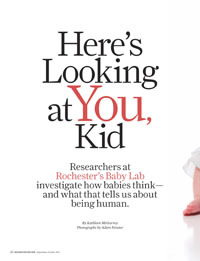 To learn more about the Baby Lab or if you’re interested in participating in future research, visit http://babylab.bcs.rochester.edu.